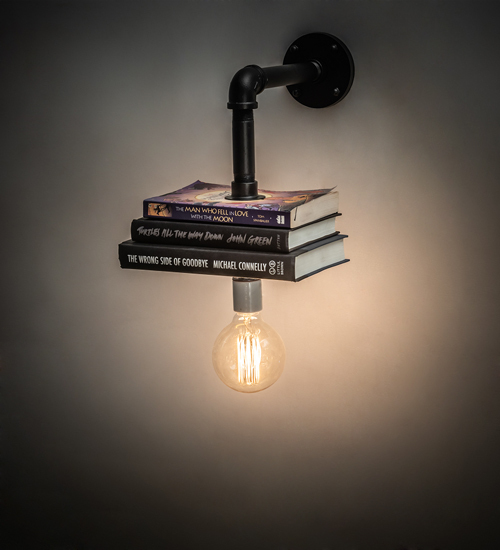 Description: A unique wall sconce that blends industrial styling with novel lighting.A Solar Black finished conduit with matching hardware are featured in this PipeDream fixture. Three customer supplied books are nestled together among this unique hardware for an enlightening look. A customer supplied Edison styled bulb provides beautiful ambient illumination. Custom crafted by highly skilled artisans in our 180,000 square foot manufacturing facility in Yorkville, New York. Custom sizes, designs, and finishes available.UL and cUL listed for dry and damp locations. This personalized item is shown as an example of our craftsmanship and custom capabilities. It is not for sale as is but can be customized to fit your personal needs.